August is holiday time. Time to get away from it all. Here in England much of the population rushes lemming-like to the coast, enduring serpentine traffic-jams in overloaded cars, greasy egg sandwiches and warm fizzy drinks on the way. The exodus is powered by reverence to a quasi-folkloric tradition and fuelled by an innocent optimism which is capable of turning grey skies blue. On arrival – finally – the cars disgorge their occupants who, with puppy-like enthusiasm overcoming tiredness, are immediately ready to plunge headlong into a pool of activities never undertaken at home in everyday life. Yipee it’s the holiday! For our family Cornwall is the grail, the south coast, Helford River near Falmouth. Weeks of waterborne thrills replace the trudge and onus of the rest of the year. On anything which floats we escape from land-based reality and navigate the waters of adventure, doing, well, nothing really; picnics on a beach, exploring rock-pools, fishing and sailing, rowing to the pub, and back again. Boats and I go back a long way. My first boat (a 36-foot motor-sailer) had the foreign-sounding name Gafita. I took this name to be an omen of adventure and sailed her to France and to the Med and back. Much later I discovered Gafita was merely a prosaic acronym for Get Away From It All. I’d done that. For years I ‘d got away from responsibilities like work and earning a living. It didn’t work. I sold her in 1988. Ever since then I’d limited my sailing activities to vacation rather than vocation. Twenty years on, that all changed. I started painting classic yachts racing alongside my usual subject of architecture, discovering the vigorous similarities between the two and enjoying the challenging differences between them, the static and the active. 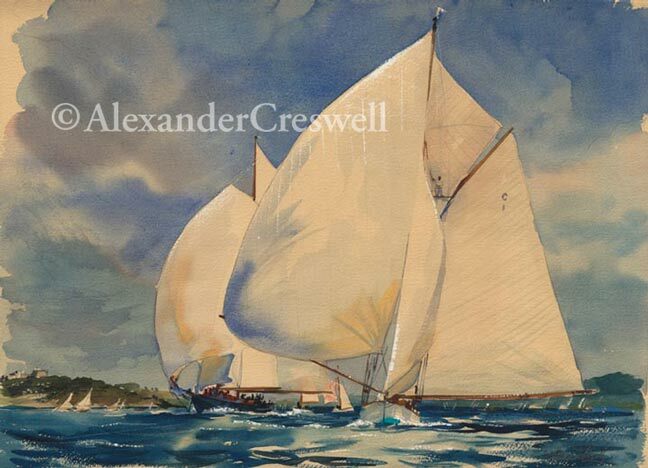 It had been in Cornwall, on holiday – getting away from it all – that this discovery had presented itself; the first regatta for the Pendennis Cup was in full sail in Falmouth Bay and I’d followed these beautiful yachts – huge over 100 foot in length – bouncing along in a RIB while trying to sketch. The resulting watercolours were shown in London and New York to great acclaim. Last year the second Pendennis Cup took place and I played a more active role presenting a number of works as prizes to the class winners in the regatta, while also showing paintings at the National Maritime Museum in Falmouth and at the Royal Yacht Squadron in Cowes. As a result of the Pendennis Cup I was asked to put together a set of paintings of the big classics racing in British waters, a group of large watercolours which would form a narrative of iconic images in the great tradition of British maritime painting. These were commissioned as a group by a family. Like members of the family the paintings would be closely related to one another even if they don’t all live in the same place. This Painting of the Month is one of the small maquettes made to establish the form of the set. It shows the beautiful Mariquita (who celebrates her centenary this year) being pursued by the schooner Mariette, four years younger but equally sprightly. They are shown charging downwind in a north-westerly with Pendennis Castle in the background, a wonderful English summer scene, Cornwall at her best. I am looking forward to working this collection of paintings. It’s unusual to create a family of works which will remain together, related, of the same blood. I love to work with my subject and being in Cornwall is where it’s at; with the smell of the sea in the nostrils, blustery showers rattling the windows, maybe a little sail on the Helford in the evening to feel the tug of the wind. A fresh crab from my pot for dinner perhaps. Just as fish tastes better when eaten in sight of the sea, so these paintings must be shown in sight of Falmouth Bay. They’ll be an impressive collection. Maybe we’ll show them at the 2012 Pendennis Cup where I will be chasing these beauties again and with them the J Class who will be in Falmouth. We’ll certainly show them on the website. Meanwhile the set of maquettes will be shown in my October exhibition alongside work from my recent Italian adventures to Rome & Venice.